Walk down “Main Street” in any business district and you will notice many awnings. 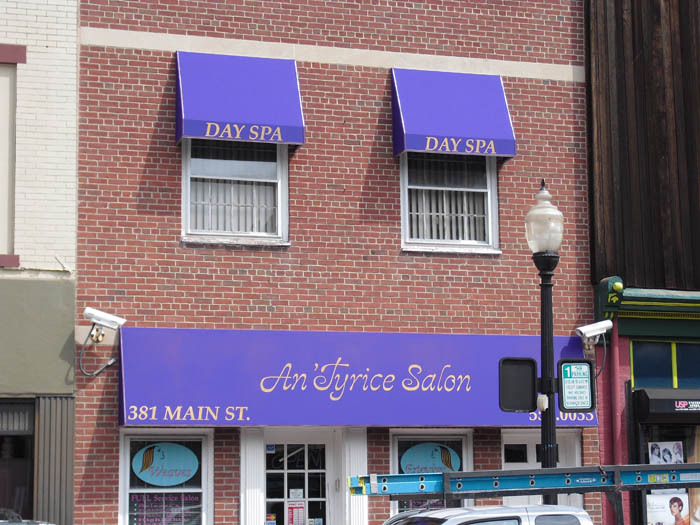 These awnings, some of which were designed and installed by Dutchess Awnings, offer benefits to the business owner and we will enumerate some of them. An attractive awning draws the customer’s eye to the store front. Often the business logo appears along with other information such as the address and services or products offered. An awning in your company colors can proudly display not only your logo but contact information as well. This form of advertising is on display each and every day of the year. It is a fact, an awning blocks the sun’s rays so the interior of your store or office will be a lot cooler. This means the air conditioner doesn’t have to work as hard which extends the life of the unit. The harmful UV and UB rays are blocked and there is less fading of curtains, merchandise, etc. in your place of business. An awning provides shelter from the sun or rain. This is true for pedestrians passing your establishment and for those businesses that have out door dining. By providing this extended space, a restaurant can serve more customers, thus increasing sales. Awnings provide curb appeal and “dress up” a building much like jewelry does a person. There is a wide variety of styles available and a representative from Dutchess Awnings can advise as to which type would best serve your needs. We at Dutchess Awnings always consider the type of building, i.e., modern, historic, etc. when advising a client. If you’re in the market for a commercial awning, here are some questions you should ask your contractor before hiring. Give us a call at 845-226-3039 or 203-942-2474, and a Dutchess Awnings representative will be happy to provide you with a free, no obligation estimate.